The achieved level of development of renewable energy technologies and the degree of their penetration into the market due to lowering the cost of RES generation already has a significant impact on the energy infrastructure. The inevitable global transition to new energy sources, reduction and / or abandonment of hydrocarbon energy – “energy transit” – will inevitably increase the impact on the structure and practical functioning of energy networks both on a technical and organizational basis. Changes in the network for implementing renewable energy (VRE) are becoming more urgent, and distribution network operators must also be evolved, which ultimately needs to change their role in response to the time challenges. 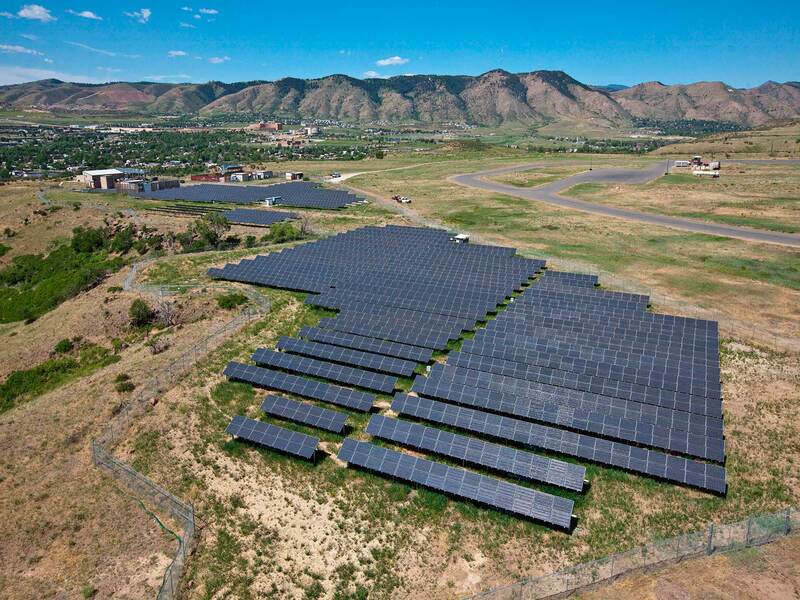 Photo: Local solar power station in a distributed network connected to a common stationary electricity grid, a community at South Table Mountain (South Table Mountain, Colorado, USA). The project has been implemented with the support of the US Department of Energy (DOE). The energy sector has steadily paved the way for a new type of energy, thanks to innovations and a rapid reduction in the cost of solar and wind technologies. In many countries, REEs are perhaps the only possible promising means to move to safe, cost-effective and environmentally sustainable energy supply. RES already affect the sustainability of further socio-economic development and improve the environment while at the same time counteracting the climate change and local air pollution. Despite the promising progress that has already taken place, the pace of the transition to a new type of energy has to increase significantly. In order to keep up with new developments and technological breakthroughs, along with market policy changes, business policy and the conditions for the introduction of technological innovations should be constantly reviewed and updated. Integrated Renewable Energy (VRE) creates special challenges for the operation of the grid as a whole. In a situation where the part of VRE in electricity production is growing, in essence, the most pressing task is to maintain the balance of supply and demand in the network. In order to minimize the cost of VRE generation and to ensure the sustainability of operation, the grids themselves need a more flexible and more integrated grid system. 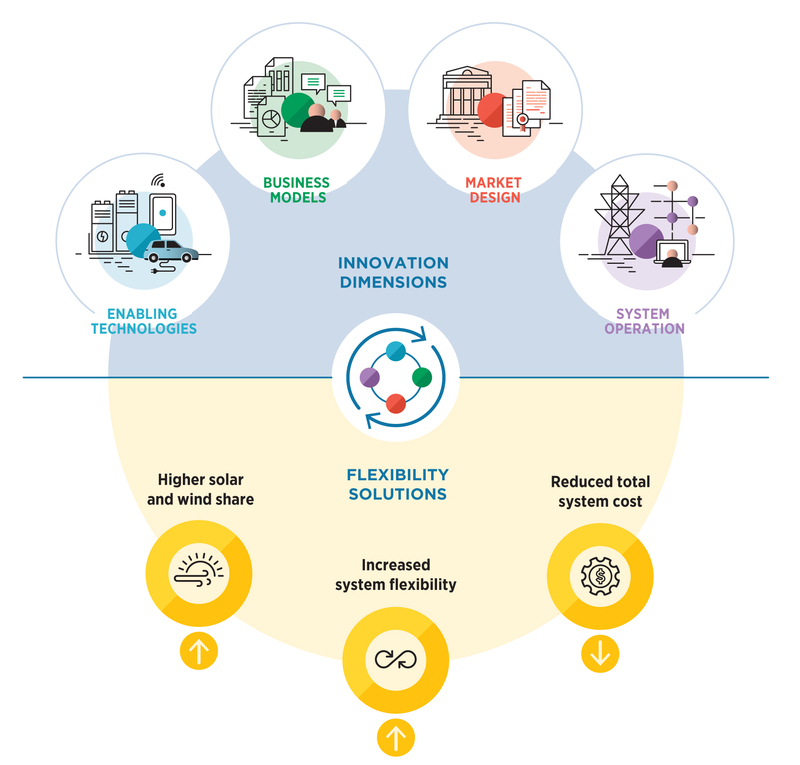 Flexibility: the ability of the grid to cope with the variability and uncertainty of generation from solar and wind power, which requires the introduction of different timelines from the shortest to the long term, avoiding the reduction of energy consumption from the VRE. Variability: the natural instability of generation from solar and wind sources, which is transformed into potentially rapid changes in electricity production, which results in inconsistencies in energy demand and supply. Uncertainty: the inability to predict reliably the future production of solar and wind energy at different time intervals. In recent years, innovative companies and far-sighted governments around the world have created, tested and deployed many innovative solutions that have the potential to radically transform the power grid. A significant variety of solutions combined with differences between local energy systems can create a confusing picture for decision makers in order to evaluate and identify the best solutions for each country or local situation. The International Renewable Energy Agency (IRENA), in its February 2019 report, “Innovation landscape for a renewable-powered future” conducted a broad and detailed analysis of the “innovation landscape” for integrating VRE into energy, categorizing them, and presenting various examples of existing ones. and implemented innovative reform decisions. Technology introduction: new technologies that promote the integration of RES. Business models: new innovative models that create new business conditions for new services that increase the flexibility of the system and stimulate the further integration of RES technologies. Market structure: new market structures and regulatory changes to promote the flexibility and new added value of energy services, which in turn stimulate new business opportunities. Operation of the system: innovative methods of operation of the electric power system, allowing to integrate a large share of VRE generation. The main conclusion from the report is the following: in order to ensure the sustainability of the new energy sector and accelerate energy transit, there are no less important measures – all measures need to be integrated and mutually supportive. Depending on the local specifics, the degree of implementation and the extent of influence can only change. In fig. 1 is showed the groups of innovations that should accelerate the energy transit and ensure the sustainability of the new type of energy. These innovations should change the whole chain of relations “goods (services) – money”. In fig. 2. is showed the “new energy world” with a significant share of REEs – due to the implemenation of digital communication technologies and data processing, the role of market participants and the direction of cacheflow across the energy sector will change. In particular, the role of purely consumers and suppliers is changing – they are more and more transformed into producers, service providers and energy distributors, that is, they partially assume certain functions of their own distribution system operators (DSO). Fig. 1. A combination of measures and solutions that provide flexibility in the energy sector. Source: IRENA - Innovation landscape for a renewable-powered future, February 2019. Fig. 2. Changes in the supply chain in the energy sector with an increased share of RES. Source: IRENA - Innovation landscape for a renewable-powered future, February 2019. 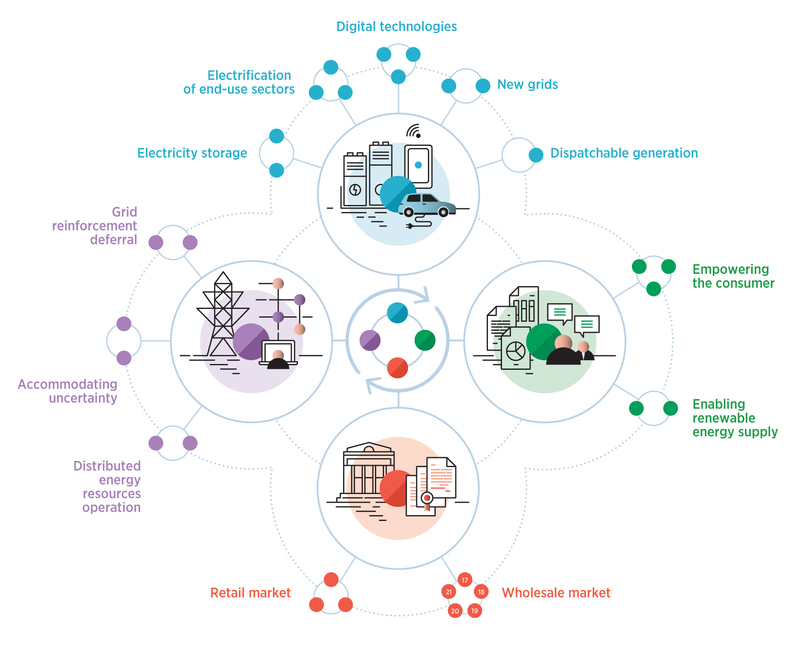 Along with technological changes, including energy storage and rapid return to the network, the organization of reliable two-way redirection of energy flows, new business technologies, based on digital capabilities for forecasting demand / supply, data processing and accounting of a stimulating price, which will affect the wholesale and the retail energy markets, remarkable changes to accelerate the overall energy transit will occur precisely in the operation of power flows and changes in the role of DSO operators, see. Fig.3. These changes are due to the development of market components and related technologies, but DSO itself will also affect the operation of a new type of grid. Fig. 3. "Innovative landscape" changes in system integration to increase the share of RES in the energy sector. Source: IRENA - Innovation landscape for a renewable-powered future, February 2019. Fig. 4. System innovations in operation of the power system. 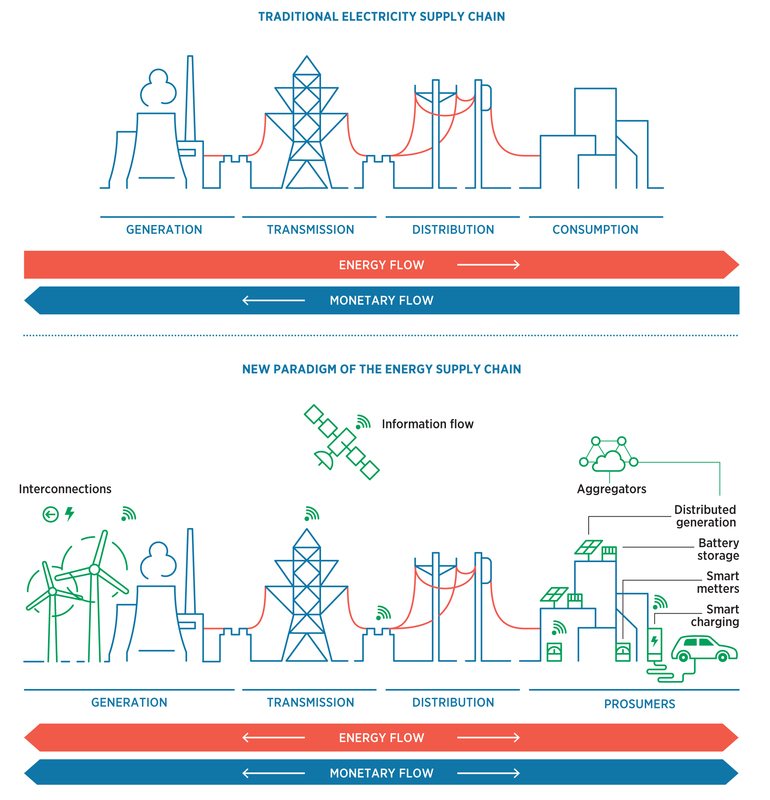 Source: IRENA - Innovation landscape for a renewable-powered future, February 2019. Operation of the system under the new conditions (Figure 4) will require intensive cooperation between distribution and transmission networks operators (and the coordination of the technical problems of two-way energy transmission at different levels of power and voltage). It will also require the elimination of uncertainty between consumer demand and generation power from VRE, that is, the development of a new level of forecasting systems. Due to the capabilities of digital accounting and forecasting solutions, it will be possible to delay the physical restructuring of the network infrastructure somewhat. The “virtual lines” of electricity supply, which are battery storage, located on both sides of the unbalanced point of the network, can provide such backup energy storage, which can, if necessary, eliminate local overload. These virtual transmission lines also delay or eliminate the need for the immediate physical updating of transmission lines. To handle at least part of the peak demand, a relatively small capacity can be used, and in addition, it will increase the consumption level with VRE. The responsibility of DSO-companies should be expanded in order to be able to efficiently manage distributed energy resources connected to their network, enabling them to integrate into their network and maximize their benefits. Purchase of electricity supply from distributed energy resources. Exploitation of distributed energy resources to optimize the use of existing networks (and delay the capital investment in a substantial restructuring) through direct control or through the formation of price signals (hourly or currently changing tariff). Key transformational measures to be taken by DSO: development of intelligent accounting, systems for charging electric vehicles, contracting with aggregators (digital cloud-based optimization and forecasting technologies), creation of platforms for real-time and safe online market real-time electricity sales ( for example, for flexibility, overload management, planning of the grid operation based on cost optimization and bonus benefits, etc.). Managing overloads within services that will be procured by network operators to increase the share of RES in the overall energy package will be a challenge, for which the DSO will be able to use flexible “behind-the-meter” models (off-use / property power generating facilities) of the energy supplier). New markets for overload management services and their respective business models must be created. It should also stimulate the application of various ESS systems – from home to powerful regional systems. Interaction with different VRE generators with the potential for accumulation – for example, with hydro-accumulating stations (PSPs) or PV-stations with CSP-drives – an excess of energy generation in the form of heat.The unsolved issue is the lack of a stable model of how to monetize DSO service and market participants interacting with them. Currently, there are a number of available technologies for providing new services (rapid electronic balancing, electricity quality stabilization, capacity matching and supply / demand) necessary for the implementation of a significant share of generation with VRE from the grid. The key issue is how to pay for new services promptly, correctly and stimulatively, so that relevant business models can support the further development and steady introduction of VRE technologies. These problems are also related to the motivation of system investments and the attraction of funds in public markets, that is, the wide promotion of new opportunities for gaining benefits.One of the ways to create a new value-added service and related revenue streams is to implement auxiliary regulation. New market designs should foster flexibility by encouraging commercial behavior, both on the supply side and on the appropriate remuneration in response to consumers, to curb / increase their demand. The implemented innovative business models will require reformatting and adapting the market structure to changing conditions of the VRE system, covering the entire supply chain, without which the energy transit will either slow down or will require higher costs. However, even when there is no regulation, the private sector can still offer some new opportunities for flexible business models based on technological innovations. For example, in the absence of demand response programs implemented by the regulator, private companies can offer consumers, in exchange for a lower electricity bill, such services as, for example, load transfer for another time, temporary energy constraints, battery usage and artificial intelligence. With the increase in the level of decentralization and digitalisation of the grid, many new generation technologies are focused on the end user. 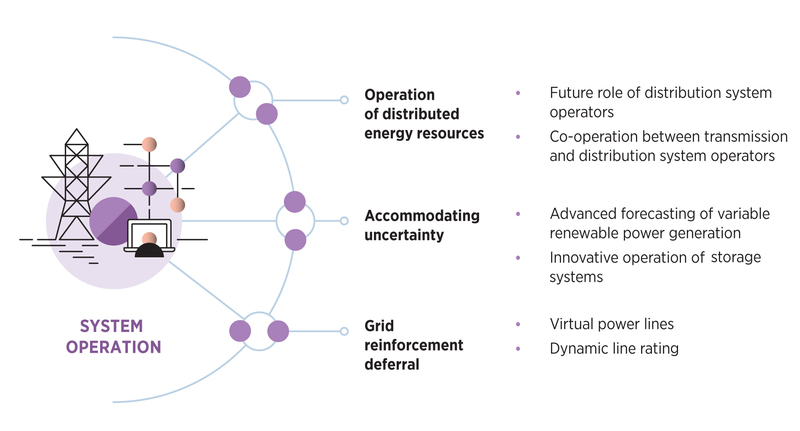 New digital technologies can support the benefits of optimizing demand and other services for the grid itself, which ultimately increases the actual network throughput and creates steady regional markets with a high local share of VREs. The optimal strategy for integrating the increased share of VREs should take into account the specifics of the country, technological conditions, status and results of the situational analysis of the DSO’s activity as a result of the interaction of systemic innovations in all aspects, which will enable the establishment of reliable and affordable energy supply systems, mainly based on RES.